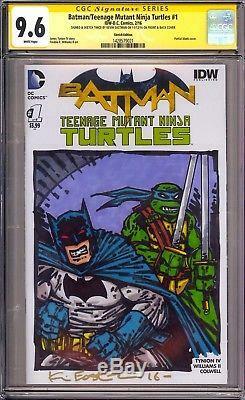 Batman/Teenage Mutant Ninja Turtles #1 CGC SS 9.6 (Partial Blank Variant Cover).. AN AMAZINGLY DETAILED BATMAN & LEO TEAM UP SKETCH ON THE FRONT COVER & AN AWESOME LARGE LEO SKETCH ON THE BACK COVER!! 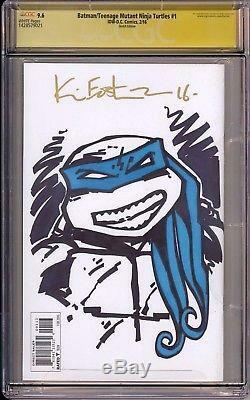 BOTH SKETCHES ARE PENCILED, INKED & COLORED BY KEVIN EASTMAN HIMSELF! A TRUE ONE A KIND!! The item "Batman/Teenage Mutant Ninja Turtles #1 CGC SS 9.6 Sketch Twice By Kevin Eastman" is in sale since Thursday, February 15, 2018. This item is in the category "Collectibles\Comics\Original Comic Art\Drawings, Sketches". The seller is "supernyce_comics" and is located in Freehold, New Jersey. This item can be shipped to United States, Canada, United Kingdom, Denmark, Romania, Slovakia, Bulgaria, Czech republic, Finland, Hungary, Latvia, Lithuania, Malta, Estonia, Australia, Greece, Portugal, Cyprus, Slovenia, Japan, China, Sweden, South Korea, Indonesia, Taiwan, South africa, Thailand, Belgium, France, Hong Kong, Ireland, Netherlands, Poland, Spain, Italy, Germany, Austria, Russian federation, Israel, Mexico, New Zealand, Singapore, Switzerland, Norway, Saudi arabia, Ukraine, United arab emirates, Qatar, Kuwait, Bahrain, Croatia, Malaysia, Brazil, Chile, Colombia, Costa rica, Panama, Trinidad and tobago, Guatemala, El salvador, Honduras, Jamaica.